About One of the more classic photos taken from the Alabama Hills up at Mt. Whitney. 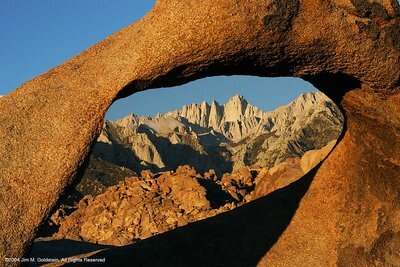 Excellent detail in the foreground rock, as well as a wonderful natural frame. The colours are complimetary to each other... the blue sky just jumps off the page. I also really like the dark shadow in the foreground... it adds a nice anchor for my eye to keep going back to. Darren this was actually not Arches NP... it was one of a few arches found in the Alabama Hills near Mt. Whitney. I did visit Arches recently and will post photos from that portion of my trip in the near future. I have always wanted to photograph arches Jim. You nailed this one on the head. I love natural framing. excellent! Fantastic gateway from one stunning scene into another. The contrast between the warm red and cooler browns strike a perfect balance. The deep shadow in the foreground really adds some dramatics. Very classic photo. GREAT GREAT SHOT JIM!!! You really chose your viewpoint and waited for the golden rays to hit that arch just right. Way to Go! !